Can Safeway Be Sued for Stupidity? None of the plaintiffs became sick from the recalled products, but they are still seeking punitive damages. “The main thrust of this isn’t about damages. It’s about getting Safeway to do the right thing,” said Daniel LeBel, a San Francisco consumer attorney who is involved in the suit. But this lawsuit makes me wonder: when did marketing practices and corporate responsibility become one in the same? What Safeway didn’t do was unenlightened and perhaps even stupid, but is it lawsuit-worthy? According to current law, there is no legal obligation to notify customers of recalls via loyalty cards, even though Safeway has been criticized before for not turning over Club Card data to the Center for Disease Control in prior cases. Somehow though, other loyalty-card stores, such as Costco, Ralphs, Sam’s Club and Walmart, do contact their members to notify them of recalls. To this, Safeway says other loyalty-card stores gather more data on their customers such as email addresses and credit card numbers, so it is much easier. Take Costo — which actually charges their customers to be members — it makes sense they have a better tracking systems for purchases since every member must flash their Costco card/ID every time they buy there. The argument, however, does not hold up a for a store like Ralph’s-another grocery store chain like Safeway. It’s true communication is spotty and to only shoppers with loyalty cards but as the saying goes “it’s better than nothing”. I imagine though that could lead to another type of lawsuit from someone without a loyalty card that purchased a recalled item but wasn’t informed. I guess it’s a matter of priority: If there was a direct link to revenue for Safeway notifying shoppers that the meat purchased yesterday might kill them, they would probably do it automatically. I guess it takes a lawsuit for their marketing folks to see the long-term benefit and overall value it would bring to both the company and its customers — It’s not their fault the are not aren’t clever enough to realize that on their own. Most large corporations either copy or innovate-in this case Safeway did neither of those. 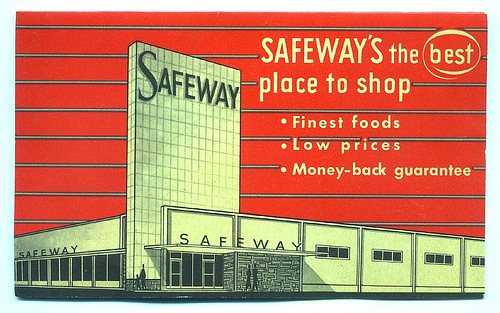 The irony is that Safeway is one of the first grocers and stores in general to have a loyalty card and market around it. They could have been a trailblazer by providing important information to their Club Card members and be considered the helpful grocer, but instead they have reinforced their position as a reviled corporate greedhouse. So, I expect Safeway to respond to this lawsuit by complying with this request in the future. From a PR perspective, it may help them and maybe even align corporate responsibility with good marketing practices. And if they don’t, the smell of rotten eggs will permeate Safeway for a long time.